We’d love your help. Let us know what’s wrong with this preview of Love Me Only by S.J. Pierce. Never give into A haunting past. A specific set of rules. One man determined to break them. To ask other readers questions about Love Me Only, please sign up. Ohhh emmmm geeee! This book is amazing! It and me laugh, it made me cry! I was hooked from the first page! I need more Chase and Jared! I need the next book like now! I would absolutely recommend this book! I received an arc at no cost from the authors. I enjoyed reading this book. Chase, the protagonist, has a history of drug abuse and a dark past. She works at a PR Firm. She does not believe in love and has two rules: 1, not to touch drugs again and 2, not to date her boss's clients. She meets with a few of her friends and friends of friends and they travel to Las Vegas. By chance at a party, she meets country music star Jared, where she initially thinks he is a fake. A growing attraction is formed between the two and they go on a few dates. However, towards the end we find out that someone from her past is haunting her. What would happen? I'm eager for the next book to find out. Wow this book is the first that ive read by these two amazing authors. This book will have your Emional twisted and will be loving the style of writing these two have put toghter a amizing book. Love this in so many ways. The honest portrayal of addiction as a continual process, the use of poetry as a healthy tool, the character development. I'm hooked. Can't wait until the next book is released! Don't judge this book by how stars I rated it. It is only rated 3 stars because it is so accurate the author describes overcoming addiction. The book tore open some healed over wounds in my family. But it did show the every day struggle of keeping clean. A point of view my family could have used before discarding someone as "not making the right choice". The way the author cuts deep to the bone and with just words can bring to light the depth of human struggle and human understanding. This is a great well-written book. The storyline and characters are very good with touches of humor, romance, and drama. This book will capture your interest from the beginning and hold it until the end. I voluntarily read an ARC and this is my honest review. Wow! I mean wow! I was given the opportunity to read this outside of a blog tour, and upon reading the blurb I had to snap it up! Being a novella too, I knew it wouldn't take long. I actually stayed up well past my bedtime to try and finish this (sleep beat me though). I could not put this down! This book will stick with me for awhile...and like an addict, I need and I want the next book NOW! This being a novella too, has left me needing more. The ending just happened so abruptly I never saw it c Wow! I mean wow! I was given the opportunity to read this outside of a blog tour, and upon reading the blurb I had to snap it up! Being a novella too, I knew it wouldn't take long. I actually stayed up well past my bedtime to try and finish this (sleep beat me though). I could not put this down! This book will stick with me for awhile...and like an addict, I need and I want the next book NOW! Chase the main woman in this book, leading a clean life now as a reformed heroin addict. She was in a relationship with someone called Chat but it was that toxic, it literally destroyed her life. One fateful night changed everything, and we rejoin her seven years after the event, clean and trying to curb her Shadow master. She writes journals and poetry and lives a clean life. She is, however, off to Vegas for her best friend Marissa's hen party, so really not the right place for her to be going. The group of girls that she is going with is a complete mish-mash and you wonder how she will cope with being in a place that never sleeps. Their first night there, they hit the nightclub, where she drinks a cranberry and lime juice drink, where she is chatted up by the country singer Jared Bryan. Known for womanising and partying and completely out of bounds for her......he is a client at the PR firm she works for but more importantly, she does not do relationships after the last one. She has one night stands, she is not a candle and flowers girl. Never doing relationships. Whilst learning of Chase's coping mechanisms with her journals etc, she has a tattoo on her wrist, Love Me Only. This book, and her journey, for me, has shown me how me to cope with the darkness in your life. Now whilst I am not a recovering drug addict, I have my own issues but I found a peace with the way she lives her life and it has inspired me to get an interim tattoo similar to Chase's just a reminder that before you can love anyone at all, ever, you need to love yourself. Anyway, back to the novella. I actually can't praise it enough, the only thing, it was not long enough! We were only just scratching the surface with the girls and the hen party and then it ended. Ended when Chase was getting Unknown callers to her phone! I mean who is the caller? Who is calling her aunt? What else happened in Vegas? Will she relapse? Did she go on a second non-date with Jared? How was Marissa's wedding? Let me start by saying that I am not a fan of cliffhangers. Really, REALLY hate them. That being said, for once I am glad I made an exception to the rule. What a great beginning and the second book can't come out soon enough for me (well, except for that whole going through winter thing right now). Chase went through a horrible episode in her life when she was addicted to heroin. Since then, she has managed to get her life back together and live with the day-to-day reminder of her addiction. She Let me start by saying that I am not a fan of cliffhangers. Really, REALLY hate them. That being said, for once I am glad I made an exception to the rule. What a great beginning and the second book can't come out soon enough for me (well, except for that whole going through winter thing right now). Chase went through a horrible episode in her life when she was addicted to heroin. Since then, she has managed to get her life back together and live with the day-to-day reminder of her addiction. She avoids all temptations and keeps herself on the straight and narrow. Her friend, Marissa, is getting married and taking Chase and her other friends to Vegas for a week. Vegas could be disastrous for Chase, but she is willing to put herself smack dab in the middle of temptation for her friend. While at a nightclub one night, Chase meets an amazingly good looking man, Jared, who's also a celebrity. You knew there was a love interest here somewhere right? And while this is going on she is getting mysterious phone calls from unknown callers. And just as I am getting fully invested with the wild group that make up the bridal party, hoping the best for her and Jared and dying to know about these mysterious phone calls - CLIFFHANGER! I really did enjoy the book and the first person account of someone living as an addict. It was a fresh approach and not something I had read before. I look forward to the second part of the duet and finding out more about Chase and Jared and the whole crew. Love Me Only is the first book of the Love Me Only Duet, and I have to say, the second book cannot be released soon enough. Addiction of any kind is a terrible demon to overcome. Cigarettes, alcohol, drugs. The best way to defeat addiction is to never open the door. Don’t even peek. I know, sometimes it’s easier said than done. However, the temporary tingle of pleasure can lead to a lifetime of fear. Nobody is perfect. We all have our moments. Many of us are never too far from hitting rock bottom. 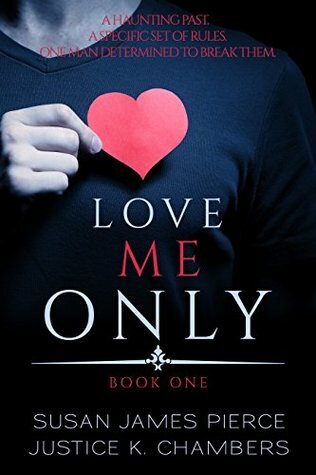 Love Me Only is the first book of the Love Me Only Duet, and I have to say, the second book cannot be released soon enough. Nobody is perfect. We all have our moments. Many of us are never too far from hitting rock bottom. Crisis hotlines exist for a reason. Rehabs help. Relapses can occur, but never give up. Be the master of your own life. I love Chase, and I totally relate to her extremist nature, but sometimes you need to let someone reel you in. People are not all the same. Bad experiences occur. Learn to recognize the warning signs. Move on. Take a chance on life. Gamble on love. The odds of hitting the jackpot may be higher than you think. Loved Loved Loved this book. I did not want to stop reading once I started. When you are reading Chase's story, you can feel her pain, and what she is going through. Her past is still there, haunting her every move, but you can see how strong she is trying to be to fight it off. Through the whole time at Vegas, you see the silent struggle that she has and add in a hot guy, and things get interesting for her. The unknown calls make the past come back even stronger, and the ending leaves you wanti Loved Loved Loved this book. I did not want to stop reading once I started. When you are reading Chase's story, you can feel her pain, and what she is going through. Her past is still there, haunting her every move, but you can see how strong she is trying to be to fight it off. Through the whole time at Vegas, you see the silent struggle that she has and add in a hot guy, and things get interesting for her. The unknown calls make the past come back even stronger, and the ending leaves you wanting more. I keep scrolling, hoping there was more, yet not disappointed in the book at all. Hopefully, I am able to review the second book as well. Read this in one short sitting as it was fast paced and gripping. Great first book! I can’t wait to read the next book. The only thing I hate is having to wait until next year. I am so glad I read this so I can follow the authors so I don’t forget about it. Can’t wait to see where this story goes! I received an advanced reader copy for an honest review. I feel that the story is a little slow starting and had to force myself to keep reading it. However, once I got to the airport scene and beyond everything started to flow and I couldnt put it down. Im not a fan of cliff hangers so I wish the book was self contained. I received a complimentary copy from Voracious Readers in return for an honest review. This is an emotional read, but I believe an accurate one regarding the daily struggles of an addict on the long road of recovery and the triggers they must avoid or learn to step lightly around. Something as simple as a relationship or love can impede her progress. Learning to trust again is a big deal, as is meeting someone who will understand and enrich her life. I enjoyed this book. I started this book thinking I was going to get the whole story but this is just book one. I can't believe I have to wait for the next one. It was a good read and left me hanging for more. Loved the characters, especially Chase. Hurry up 2019 so I can read more. I got to read this book for free through voracious reads. The books was really good and shed a realistic light on trying to overcome addiction and death. Couldnt put it down, need to find the 2nd book now! I won this book in a giveaway. I am giving an honest review. This book is amazing!!!!! I love the main character, Chase because she is such a strong character!!!! She moves and improve her life with the help of her aunt. It is an amazing book, I highly recommend this book. A riveting, poignant novel looking at addiction and this book has heartache, courage, humor, drama, and I LOVED IT! Mesmerized me til I finished it! Can't wait for book 2. I received an ARC to read and review at no cost from the authors. Such a fun read! Loved the character voices and was fully invested in the story! I can't wait for the next book, I need to know what happens next!! This book had the potential to be good but it ended in such an unsatisfying place. Not in a 'what happens next? I'll buy the next book' kind of way but more of a 'nothing really happened or got resolved' kind of way. It was as if the authors got halfway through writing a book but just decided to publish it anyway rather than waiting until it was actually finished. I'm sure book 2 will be good and finish everything off but they should just be merged into one book and published together. Good beginning. I definitely need to read the next book as I wonder where it will take them. I loved this book! The main character tells the story. She is young, vibrant and witty. There were a few laugh out loud moments and the opening scene had me hooked. I read this in a few hours and didn't put it down. I will definitely be checking out part 2 when it is released! LOVED IT! I seriously don’t know how I am going to wait until 2019 for book two in this series. I NEED to know what happens next. Chase is such an amazing character. I love how she takes accountability for her past mistakes and makes good choices when it comes to certain situations and knowing her limitations. Fran though. That’s my girl. I’m going to start actively seeking out my own real life Fran to become besties with. It needs to happen. There’s definitely more to Jared than we’ve seen so far, and I’m I seriously don’t know how I am going to wait until 2019 for book two in this series. I NEED to know what happens next. Chase is such an amazing character. I love how she takes accountability for her past mistakes and makes good choices when it comes to certain situations and knowing her limitations. Fran though. That’s my girl. I’m going to start actively seeking out my own real life Fran to become besties with. It needs to happen. There’s definitely more to Jared than we’ve seen so far, and I’m so excited to find out more in the next book. The thing with the napkin made me fall in love with him a bit. Omggggggg I can’t wait for book two!! !